The Barn Hollies Farm01263 576417work Self-cateringPeaceful barn conversion. Sleeps two. Kitchen/dining room, shower, basin, toilet, sun room, garden and seating area. Off road parking. Rural views. Oil central heating. Towels & linen provided. Open all year. Peaceful barn conversion. Sleeps two. 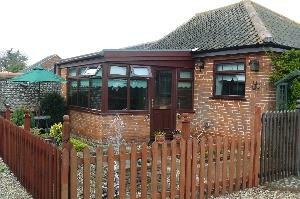 Kitchen/dining room, shower, basin, toilet, sun room, garden and seating area. Off road parking. Rural views. Oil central heating. Towels & linen provided. Open all year. Ground floor bedrooms Totally non-smoking establishment Children welcome from any age. From Norwich (A11 onto A140) to Cromer. 2 miles before Cromer go onto B1436 to Southrepps/Thorpe Market. Onto Southrepps, go past Vernon Arms pub which will be on the left hand side. In 1 mile take the third right. The barn is 0.5 mile down this road, second from the right.